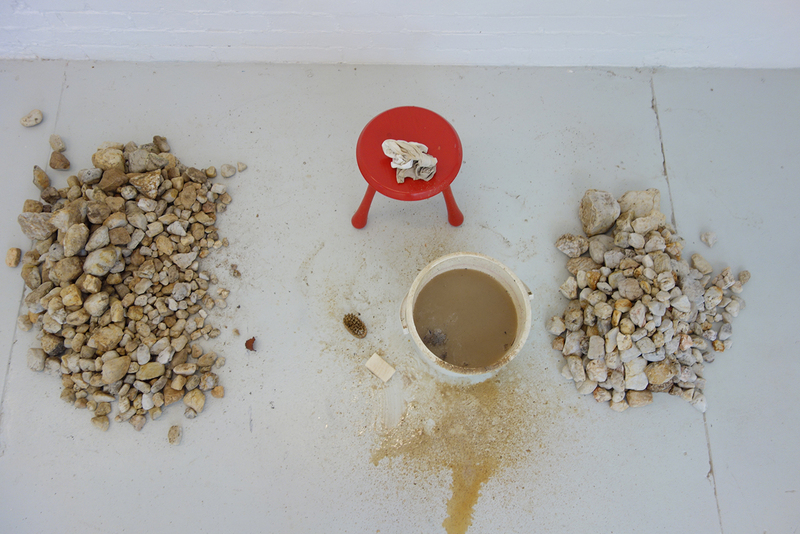 A week of experiments at Punctum Day 5 with Klara Kelvy. Jude wants to know: Does durational process lead to making, or does making lead to durational outcome? I’ve been thinking about: Repetition, duration and creating meaning; and how human’s contextualise themselves within their environment. For my last experiment I decided to introduce drawing to the performative process. I have been playing with drawing documentation of my performances for the past couple of years. More recently I have found that repetitive patterns, and observational drawing work similarly to meditation for me. Today my experiment was to introduce observational drawing into my process of building the circle. 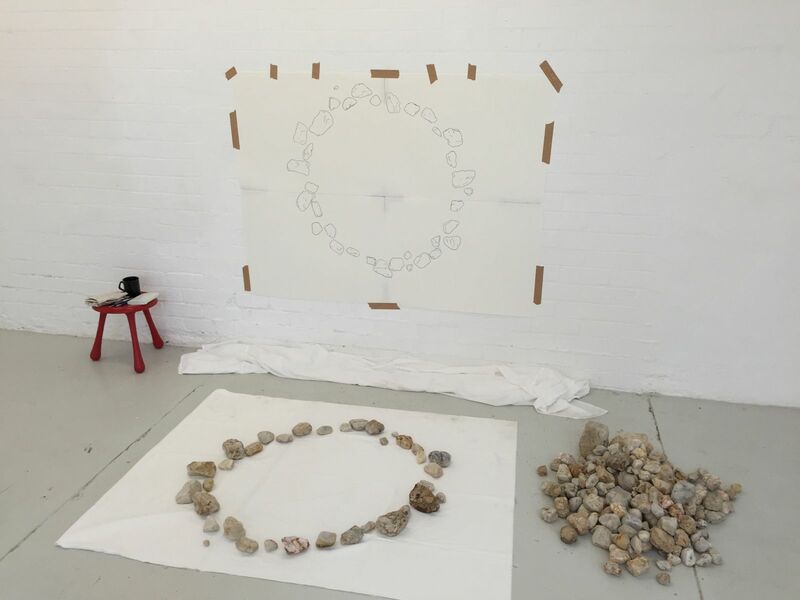 My aim was to see if I could swap my repetitive process of stacking rocks with the repetitive drawing to transform physicality of the rock into an idea of a rock. Thus the viewer could place the rocks into their own context, their experience of repetition, duration, cycles and the natural environment. This would help me connect to my initial intentions to investigate how people connect to and understand their environment, and creating meaning using repetition and duration. As I drew I thought about why people draw. Drawing transforms the object into an image, making the idea transportable, and malleable via the artist into the new context. When I drew these rocks, it was for people to look at, but also so that the ideas and processes I have been working with over the past week could be transported with me, back to Melbourne, and considered further. I feel like I cannot say if my experiment was successful today because it was the beginning of a process that will take a lot longer: The process of making this series of experiments with and for myself, to making an artwork with and for other people. By partaking in this intensive week at Punctum I have come away with a structure for working. Jude’s request for daily updates and prompting questions gave me a scaffold to stretch out techniques, processes, and ideas that I have been collecting for years. Using this framework that Jude describes as Action Research I have been able to take risks, let my ideas lead me to unexpected perspectives, dive head-first into unknowable outcomes, and make without cutting myself short before I’ve even begun. This style of working has let me balance the spontaneous and intuitive maker with the critical and structured editor. If my rock circles develop into live art outcomes you may see some more of me at Punctum in a year or so. Thanks very much to Jude for her structure and mentoring, Adrian for his ever-helpfulness and serenity, and Ellen who was a surrogate mum to me, nurturing me with some truly delicious dinners this week. A week of experiments at Punctum Day 4 with Klara Kelvy. Relocating my rocks yesterday I was thinking a bit about how changing the context of an object can give it different significance. My aim in changing my location and activity was to better understand the rapport I was starting to have with these rocks, and how others would perceive my actions. This week I’ve been reading a small stack of old National Geographic mags I got form the op-shop in town. Two articles have fascinated me in particular: The first is about Palaeolithic humans and features some really beautiful art they made, the other is about the Byzantine Empire. Apparently when Emperor Constantine Christianised the Roman Empire his mum popped over to Jerusalem on a pilgrimage, and handily found the real cross, the crown of thorns, and the lance along with the tomb of Christ. These relics and others that get discovered are constantly being removed, cleaned, sometimes decorated, and recontextualised in special spaces where they can receive the reverence they deserve. If they had been left where they were, undiscovered, they would have continued to languish in the guise of some bits of old wood, a circle of weeds and a hole in the ground. Today I set up the camera, my large pile of rocks, scrubbing brush, soap, towel and bucket of water ready for the new action. I scrubbed with the intention of finishing. After almost three hours I threw in the metaphoric towel and squeezed out my real towel. I hadn’t even done half of the rocks, my hands and feet were cold, my body hurt and I really needed to go to the loo. Finally a durational exercise that beat me. What did I learn? That perhaps I do need durational exercise as part of my practice, but that doesn’t mean the audience has to be there with me. The mind numbing boredom of that action and the others I have done over this week helps me think and connect with the materials and context, it deepens my understanding of the work in a way only time and sweat can. Last night I decided to continue with the stone circle this morning, and then once it was done destroy it as quickly and effectively as possible. I built again for another hour and a half until the circle seemed complete. While I built I though about it’s destruction and where I would go from there. It needed to change that was certain, but flinging the rocks into the bush or kicking them away didn’t quite fit with my mission for meaning. At completion I still had some patients and endurance left, and I had already ruled out destruction. 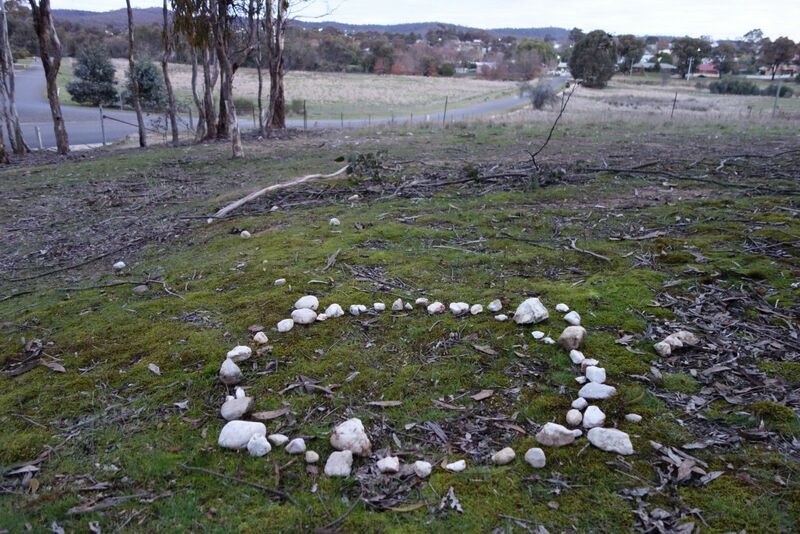 After documenting the circle I stood back to look at it and thought of how I really preferred the idea of the documentation as the work rather than the stone circle, or the action in the bush. Further to this I wondered if a sculpture could exist in time instead of space. So I made an hour-long hand-held video of the circle. I decided hand held was important as the work was an exploration of duration for the artist, meaning my body is one of the central aspects of the work, so hand-held was the only logical option. I had some ideas on what to do with my rocks, they needed a new context, and Adrian from Punctum kindly gave us all a lift to the White Space, but more on that tomorrow. One: Adrian is very patient and helpful (I already knew this). Two: Although process has been a big focus for me this week today I realised that the outcome(s) needed to be considered just as carefully. These outcomes would be different to those initially imagined as, through the process of making the work, I have come to understand it a bit better. I now know that the experience I have creating the work could not be understood by an audience in the way I had first imagined, and so I need to consider what the work looks like from the outside. Last night I realised I wasn’t satisfied with the stone circle I had made that day. It was quick and easy and meaningless. I decided on two things, it wasn’t long enough, I need to push myself into a state of monotony through repetition. And that, if meaning is what I’m looking for and I’ve still not found it, then I need to keep repeating this action. 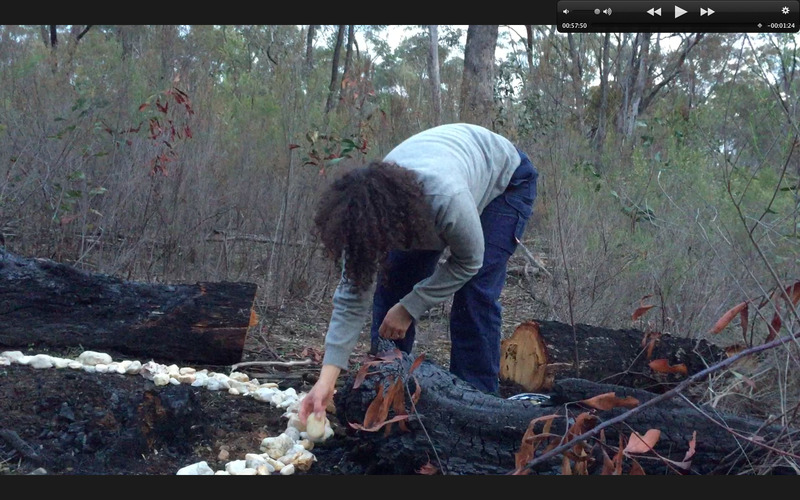 My plan was to make a video, this time building a bigger circle, with quartz and to keep going until I had to stop. I found a spot in a park close to where I am staying and I set to work. Soon after I started some kids on bikes rode down a track near where I was working and called out to me. I didn’t reply not knowing how to respond (what was I going to say and how would that impact my video?). But as they went off to play on a nearby hill I began to think about what our conversation could have been. Essentially I was doing something in an attempt to create meaning, I was trying to make something from nothing and some discussion on the subject surely wouldn’t hurt, especially as my work usually has an interactive element. After about 45 minutes both of my cameras had given up. Despite this disappointment I had some idea of what I was doing and I returned home in the fading light. What I learnt about my process today was: that I was struggling with how I was thinking about what I was doing, persisting with an idea yet uncomfortable with the framework I had given myself. Only when the kids interrupted my process did I gain a new insight into what I was doing. I tentatively propose that intuitively I have understood that by working with the public I can develop fresh perspectives on what I’m doing. This could explain why I have always had a semi-public development process for my performance and interactive work. Walking through town today I noticed my thoughts have been going in circles, so I decided to walk with a Dictaphone recording my thoughts out loud. My experiment was to walk for an hour out into the countryside. My hypothesis was that my thinking would begin with myself, going around in circles. As I moved from the town into the countryside I hoped I would take in more of my surroundings and begin to think more expansively, present within my environment. The outcome was that, by verbalising my thoughts I very quickly began to incorporate my surroundings into my thoughts and the stories I told myself. The progression into the countryside did divert my thinking a little but only to follow wombat tracks and appreciate the quality of light or texture of a bridge. However by rambling so, I missed my intended turn and ended up at the Children’s Cemetery. This was surprising and uncomfortable, leading me into new thoughts. The small circles of stones to denote the graves were very romantic amongst the trees and moss in the afternoon light. The graveyard had not been used since the 1850s and being children when they died they wouldn’t have had direct decedents to mourn them, so the recent addition of teddy bears to some of the graves puzzled me. In the 1920s the graveyard had been fenced and restored. More recently plaques had been put on some of the graves, to give viewers an idea of what the faded headstones had read. The fascination with these dead children reminded me of the cover from National Geographic I had seen in the op-shop earlier, a photograph of a wide-eyed mummified baby. As I left the cemetery I thought about how the circles of stones had fixated me, and how people often create circles of stones to mark significant places. I collected some of the white quartz I had seen scattered about. When I came across a few bones from some long-dead and eaten road-kill I decided to make a video to process what I had seen and thought. I have learnt something general about my process: that I am very suggestible and by exposing myself to and consciously paying attention to stimuli (both sensory and new ideas or perspectives) it can result in action and making. Part of this is because I will find patterns and coincidences anywhere I can. The World of Hidden Sounds is the inaugural Seedpod Amplified presented by Punctum Inc. It brings together former collaborators, sound artists Simon Whetham (UK) and Eamon Sprod (AU), who in 2012 worked closely with local sound practitioners Jacques Soddell and Lizzie Pogson to produce Seedpod Project, Active Crossover. Staged in Punctum’s underground ICU performance space, it was a deeply engaging, “graceful and kinetic” site-specific sound installation, revealing accomplished artists with a deep love for exploring active listening through live performance. Similarly The World of Hidden Sounds aims to transform an entire building into a sound system, this time Old Castlemaine Gaol. Harnessing the talents and support of Grade 5 & 6 students from Castlemaine Primary School (alongside teachers and parents), it is a community collaboration of epic proportions, with weeks of planning, preparation and creative collaboration involved – including field recordings in locations as diverse as the local landfill (tip), Hanging Rock, Deborah Goldmine and Forest Creek. Two weeks out from their concert, Simon Whetham and Eamon Sprod have kindly taken some time to answer a few questions about The Hidden World Of Sounds, and their collaborative process in Castlemaine. What do you love about working with sound? SIMON WHETHAM: I find the whole process of working with sound exciting: from the discovery of an interesting or unexpected sound to capturing it, from editing and composing to performing and activating a space in an intangible but physical way. I also enjoy that there are (or should not be) any rules governing this area of creation. I have my own tastes and preferences of course, but why shouldn't I try and use sound sources as diverse as crickets, electromagnetic hum, radio waves, fire, guitar or struck metal rods to create work if they have a place within it? EAMON SPROD: I suppose I have always had an equal interest in contemporary ‘visual’ art and music, so at some point it just seemed logical to somehow bring them together. Or perhaps more accurately, I stumbled upon the idea that you could bring them together which seemed to make perfect sense to me. Sound retains a sense of mystery. I can record a sound and then by simply removing it from its location of origin, its source, it is abstracted to the point where a listener does not know where it comes from or what it is. All they know is that it comes from the ‘real world’ - an idea I personally reject as there is no ‘real world’ - and will place their own story or meaning upon it. Increasingly through my work I have become aware of how much you can learn about your surrounds from sound, how it shapes your experience of the every day and how sound can be manipulated to effect your experience or behaviour, both for good and for ill.
How would you describe your approach to working with sound – and the kinds of works you make? SW: It's always about exploration for me and I still tend to work with field recording techniques and various types of microphones to investigate a location, combining recorded sounds with physical actions. I have previously worked with installations, but for me the direct exchange found in concerts, lectures and workshops is much more preferable. Over the last few years my work has become more concerned with exchange rather than the impersonal presentation of a result. This carries through to my desire to collaborate with different artists. There is always an exchange, always some compromise, always something to be learnt. In regards to performance improvisation, even within a structure, it is essential. I don't want to perform the same work over and over again. I want to present something unique and responsive each time I perform. ES: At its core I have always thought of my work more or less as collage. I take the sound of one location and combine it with another and make a third space altogether. Like William Burroughs and Brion Gysin's ‘Third Mind’. I personally have no interest in ‘field recording’ as documentation; rather I gather various sounds, objects and actions and somehow combine these to create a response to my experience and/or thoughts about a location or situation. Essentially my work is process driven, so I tend to look at the ‘finished’ works - be it a CD, performance or an installation - as a by-product of that process, rather than the point in itself. That is not to say that the end product is not important; it is, it is just not the sole or even major point of the process. Art is most interesting to me personally as an activity, not as something to sit back and observe. Hence doing things like workshops where people get to actually have some input into creating their own experience. It is interesting that while most people aren't really that interested in noise music, they are more than happy to make it themselves!! The best compliment I had regarding a performance, which was here in Castlemaine at the ICU, was being sent an email afterwards saying that while the person in question had enjoyed the performance, he and his girlfriend’s bicycle ride home in the dark afterwards had been their best ever, as they really heard the ride and their surrounds in a new way. I can't ask for more than that! What is the value of site-specific works? SW: Working with sound, it becomes clear very quickly that every space has a different sonic quality. To explore the space and the objects within it is one thing that keeps me excited about what I do. Personally speaking, the value of site-specific work is (as I mentioned above), it makes a work unique, even in some small way. It is always a challenge to work with new spaces and places, and people, which test your methods, approaches and ideas, creating a certain tension. And there is always the risk of a project failing - which can't fail to contribute to that tension! ES: I don't know about value, but I find site-specific works particularly interesting for myself because they open up a whole new world of possibilities for sound exploration. Sound very much operates within space, so an exploration of sound often becomes an exploration of space. I guess this is the core of site-specific sound works. Again it comes back to showing people a different perspective on an awareness of things. So for many of these works, sound and the physical space become equal participants in the work, one being shaped by the other. In fact the space makes many of the decisions for you; what sort of sounds can be found in the space - and how sound is shaped by the location - dictates what sounds you can use; how the building is physically laid out affects not only the sound, but also where you physically place an audience and yourself in relations to the sounds, and so on. To make a slightly clumsy musical analogy, the space becomes an instrument. In some ways you are working with space as much as with sound, and personally I find these explorations endlessly fascinating. Could you give us a brief a snapshot of your process behind The Hidden World of Sounds? SW: The original idea behind the project was to work closely with Eamon and a group of young people in Castlemaine to explore the town for those sounds normally unheard, either because they are drowned out by traffic and everyday human activity or because they can't be heard without, for example, putting your ear against an object. It was based on a much larger project I participated in in Colombia last year where I worked with seven groups of youths across the city of Medellín. The project in Castlemaine has more focus on our methods and the reasons behind what we do, giving the students of Castlemaine Primary School the tools to listen more actively, notice these often neglected sounds and record them. We go on to demonstrate how this approach leads to the exploration of a space – in this case the gaol – and how we then apply this exploration to a concert setting. It is an extension of the process in that the participants will be demonstrating to an audience what we have been demonstrating to them throughout the project. ES: We started with an idea based on a series of workshops Simon had given in various locations around the world, working more recently with kids - showing them a little about how sound works, how various microphones work and what you can do with these sounds etc. We have adapted this as we have gone along, as various situations have altered the possibilities of what we can do. For example, working with large groups and limited time within a school caused us to drop many of the things we would have liked to explore, in an attempt to get to what is perhaps more essential. We have then had to adapt some of the things we are dealing with in the school to fit into a performance within the Old Gaol, so we have been looking how the Gaol is physically and sonically set out, how we can compose a piece for various groups of kids to explore and exploit these aspects. Hopefully the kids will be able to contribute to this as much as we can. I am much more interested in getting them to help shape our response to the Gaol, than the reverse. Simon, this is your second trip back to work with sound in The Goldfields; what draws you to it? How would you describe the types of sounds you find here, and makes it unique and enjoyable for you, as a sound artist? SW: This second trip allows me to continue a working relationship that was started over 2 years ago with Mr. [Eamon] Sprod, an amazing artist and now good friend. And also to reconnect with a few other friends I made when here last time. During my last trip [for the ‘Active Crossover’ Seedpod], Lizzie Pogson, Eamon and I took a trip to the dredge and to Maldon. I think this was the only time I actually got to explore outside of the ICU – the space on which we all concentrated our efforts (Jacques Soddell included). I still remember that trip; our travelling there together, clambering across the rope to get access, investigating the dredge's sonic qualities. I enjoy shared experiences such as this and the Goldfields seem to have a certain freedom that allows one to do this more easily than say the UK. I also felt I did not get to know Castlemaine, the town and the people, at all last time I was here, so wanted a chance to do so. Simon, what do you like about working with Eamon? Have you learned in particular anything from him? SW: I am a big fan of Eamon's work and also count him as one of my good friends, but working with him has been interesting. Although we have very similar approaches to our work, we come from different viewpoints and backgrounds, artistically. I feel we also have similar ideas when it comes to producing work, but end up in very different places. He is creative and resourceful, grounded, and decisive without being overbearing, which has made him an excellent collaborator. Often I get swept along in the flow of a project and can lose track of the reason behind things, which he has been mindful of keeping us aware of. And Eamon, this is your second time collaborating with Simon too; what do you value about this collaboration? ES: Collaboration is a central aspect to a lot of sound practise. While Simon and I think fairly differently about a number of things we do seem to work well together. This difference of view is what actually makes collaboration interesting; it allows you to step outside of your usual response to a situation and get pushed or pulled into new areas. You have to give up (some of) your own personal prejudices to the benefit of the final project. Which is - when it works - an interesting and enjoyable learning experience. Simon is very much a ‘do-er’; he is up for stuff. I have a tendency to overthink things (although I am making no claim about the depth of these thoughts! ), which can bring me to a stand still. So working with him helps me to actually leave the house and do something!! How are the children from the primary school involved in this collaboration – and their reactions to the project? Have they embraced the task and activities? SW: The initial idea for the project to involve the children was to explore the town with them much earlier on in the project. However we only had one hour each week with the groups and we felt it was essential that they have a fundamental understanding of what it is we do before dashing around town with recording devices and contact microphones. The children were going to show us the town, exploring its obscured sounds and at the same time helping us engage with the townsfolk in the street or in their stores. Although this has occurred much later in the project than anticipated, all of this did happen during the first of our two three-hour holiday sessions. We had some children who had not attended the class sessions come to the holiday sessions, but the ones who had explained the whole process and all the activities, including the thought behind them, perfectly. These participants who have been more deeply involved - and their incredibly active parents - will be participants in the concert presentations we will be holding at the gaol. Eamon - what has the experience been like for you working with the children at the primary school? What do you think they have brought to the process? ES: Working with the kids has been great; they are so much more up for things than we adults, and their enthusiasm and curiosity is great to be around. It has been difficult within the class time to be as expansive as we had planned, and difficult to get as much input as we would have liked, unfortunately. But I think the kids enjoyed our activities and hopefully we have left them with a few the seeds of a few useful ideas. Our first holiday workshop was great; kids discover so many things we miss. Our second workshop is coming up and will be in the Gaol, so this is where we will hopefully get some more direct input from the kids into how the performance will take shape. And hopefully give them much more opportunity to put some of their own thoughts and experiences of into practise. And who else have you both worked with and received support from, with here, in Castlemaine? SW: We have collaborated closely with Joseph Bromley and Thais Sansom, the teachers whose classes we have been teaching at the school, and of course the children. For me personally, I have been strongly supported in many various ways by (in no particular order!) Rex Hardjadibrata and Caty Christofakis, Tony Falla and Michelle Grobie, Klare Lanson, Dani Powell, Anthony Salpietro, Lizzie Pogson, Wayne O'Toole, Carmela Leone, Georg and Klaire at the Central Deborah Mine. And I'd really like to mention here, not only have I been lent a very nice mountain bike by a complete stranger (thanks Anthony Salpietro! ), but friend and fellow sound artist Lizzie Pogson has lent us her car for the remaining 2 weeks of the project, which gives us a huge amount of freedom to explore further in this short time. And the ever-increasing number of people who want to know more about the project and invite me/us to dinner is incredible. Thank you people of Castlemaine and beyond! ES: Castlemaine Primary have been really keen and supportive, in particular the performance teachers Thais Sanson and Joseph Bromely have been wonderful and without whose support we would have struggled greatly. For our first holiday workshops, two parents Sam and Joel joined us and apart from their assistance with the children, they seemed to really enjoy the experience and ended up as equal-part participants. They would guide the children, taking them into shops and finding the points of the creek to stick their microphones into etc. It was really great to have them along. Many of their thoughts, observations and questions were of great benefit to us. Simon – any parting words from you about working on this Seedpod Amplified project? SW: I did mention that this project is still very much a process, although the expectation was to present something more 'finished'. How much time we had to devote to administration of aspects of the project. All of these factors - and more - have meant that the project is already very different from the one proposed. This is not a negative statement - the result is totally defined by it's taking place in Castlemaine – a response to the town. And I can assure you, it will still be challenging and ambitious, and fun for both us the performers and the audience! ES: Our work is really very process-driven, so despite all our scheming and planning we won’t really know what is going to happen until it has happened. Which is what makes it both anxiety-inducing and fun! * Thanks to Simon Whetham for supplying this quote!